BETDAQ, founded in 2000, is the trading name of Global Betting Exchange, registered in Ireland with company number 325422. BETDAQ is a superb online betting exchange and sets itself apart from its rival and industry leader Betfair by charging a significantly lower commission of 3% (that is only paid by the winning bettor), as opposed to Betfair who charges 5%. BETDAQ’s other main selling point is that their odds, on average, are 20% higher than those of traditional bookmakers, due to the unique arrangement of the betting exchange. Payment choices are good, customer service is great, the odds are some of the most competitive online, and so BETDAQ is quickly becoming one of the best places to do your betting online and a highly recommended choice! BETDAQ recently launched a very interesting promotion (more details below) fore new customers: enter promotional code ALLBDQ03 and claim up to €200 in free bets! 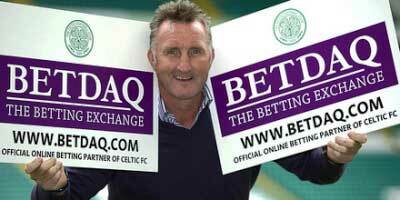 BETDAQ is a Exchange with a Betting license in Ireland. • To avail of the €/£200 free bet promotion customers must enter code ALLBDQ03 at registration. • On paying €/£25 in commission a qualifying customer will be given a €/£25 free bet. • For each additional €/£100 in commission paid, the customer will be given an additional free bet of €/£25 until a cumulative total of €/£200 in free bets has been awarded. • Accounts which have met qualifying conditions will have free bets credited within 72 hours. • Free Bets balances cannot be withdrawn until they have been bet with at odds of 1.5 or greater. • Members cannot match free bets with themselves. • Promotion applies to new registrants from January 1st 2012 until the offer is withdrawn by BETDAQ. • Qualifying customers will have a 3% commission rate applied to any bets placed between January 1st 2012 and December 31st 2012. • Commission offer applies to BETDAQ exchange betting only and does not apply to BETDAQ multiples. • Net market winnings from bets placed at different commission rates will have a weighted average commission rate applied. Open a new account with Betdaq !!! "Betdaq Review: all you need to know about one of the best betting exchanges"